Today we made the exciting announcement that Nu-Heat has secured investment from new shareholders as part of plans for continued growth. We have a proud 25-year history of delivering fully designed, energy efficient underfloor and renewable systems and are the only heating company to have been awarded the UK Customer Service Standard, ServiceMark, which we hold with Distinction. A management buy-out, led by our Managing Director, David Roberts, puts the company in a great position to continue to deliver the same high quality, innovative products, expert technical support and outstanding service that our customers have come to expect. 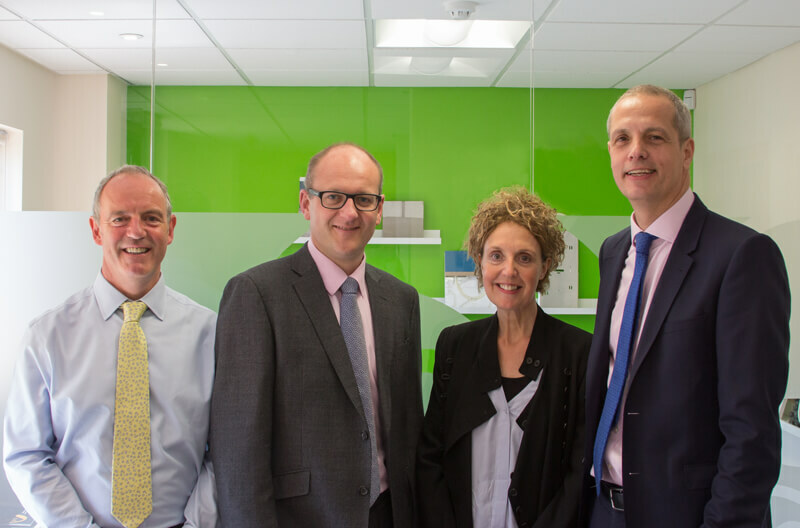 David Roberts, Nu-Heat Managing Director (second from left), with Andrew Grimsley, Alison Troop and Adrian Troop who announced their retirement today. Having dedicated much of their working lives to the company, Directors Andrew Grimsley, Alison Troop and Adrian Troop, have decided to retire. Everyone at Nu-Heat extends a big thank to each of them and wishes them a long and happy retirement.